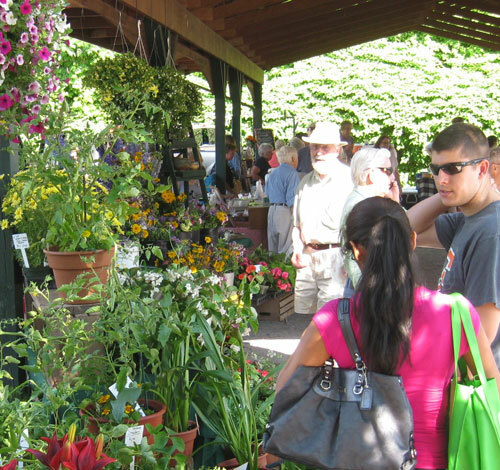 Our farmers’ market started in the late summer of 1978 in the Spring Street parking lot, Saratoga Springs. A small committee met several times prior to that at the Saratoga County Extension Service, now known as Cornell Cooperative Extension. A space in a parking lot was negotiated with the City. Unfortunately, it rained many of the market days and the only protection was a few patio umbrellas. Few customers came and the less than ten vendors became very discouraged. But some did not abandon the idea. The farmers’ market concept was a challenge and we wanted to see it succeed. Through the following winter and spring, we organized a board of directors, elected officers, developed a constitution and by-laws, and took the necessary steps to become an incorporated, not-for-profit organization. Farmers’ markets were in the developing stages throughout New York State. Organizational support from the Extension and readily-filled volunteer positions held promise. The next season seemed more promising: a few more vendors joined the effort, publicity increased, more customers came. Within a few years the markets spread to Ballston Spa, South Glens Falls, Clifton Park, Malta, and Wilton. Saratoga Springs continued to be the strongest market. There was an effort in the mid-80s to move the market to High Rock Avenue across from the auto sales, in keeping with an offer by some city officials. However, there was considerable opposition to that by some vendors and many local residents. During the 1990s, the markets continued growing, both in number of vendors and amount of products offered throughout Saratoga County, especially in Saratoga Springs. The subsequent construction of the High Rock Park pavilions by the City, with the help of some donated funds, gave the farmers’ market in Saratoga Springs a wonderful “permanent home” during the warm-weather months, in a remarkably beautiful setting with ample parking. As the market expanded in the early 2000s, people began thinking about offering a winter market. We have been in a few locations in town, working together with generous community groups who offered their facilities. From 2009 to 2013, our winter market was held at Division Street Elementary School, just a few blocks west of Broadway. Beginning in November 2013, the market’s winter market moved to the Lincoln Baths building at Saratoga Spa State Park at 65 South Broadway. From the rainy market days in 1978 until the present, the farmers’ markets have survived, grown and prospered. They have become an institution, a social center for surrounding communities. Want to see your nearby neighbor or someone across town or out of town? Go to the farmers’ market, have a good visit and take home some goodies. The history of the markets has really been written by the perseverance of the growers, bakers, crafters and other vendors; by the generosity of officials of the municipalities where the markets are held; and most of all, by the customers.